Beeping is a known phenomenon in Africa. A beep is done by calling and hanging up after one ring. 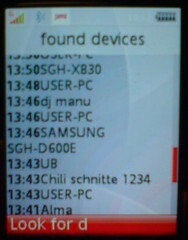 This is a cheap alternative to sending a text message or calling someone. Daniel Peltz built a simple live feed installation, that allowed Cameroonians to "beep god". A spontaneous public debate occurred around the site of the projection, which lead to several interviews. Watch the video of the installation and the interviews. The beeping function was created as a means of getting someone to call you back. When I beep someone in Europe, it means "call me back," usually urgently. But here in Cameroon, what does the beep mean? If I beep you once, it might be to say hello. If I haven't seen you in a while, it could be to say I haven't forgotten about you, I'm thinking of you. It could be to remind you that you should bring me the book you promised. If you take me to the bus in Yaounde and I beep you later, it would mean I've arrived safely. Or, if we're separated and I beep, it could be to say that I've gone back to my house. We've developed a whole system of coded, culturally specific communication. This corresponds to the statements of Jonathan Donner in his paper "The Rules of Beeping", that the meaning of a beep depends on the context. If Cameroonians have expanded the meaning of a beep it is due primarily to their cultural heritage. They have a tradition of communicating through sonic resonance when they used tam-tams for example. Via the blog of Jonathan Donner. I wrote a guest post for UsabilityBlog.com about the annoyance of Sony Ericssons PC Suite Version 2. Thanks to the host of the UsabilityBlog Paul Sherman for letting me do that guest post! A copy of the post is archived below. If you want to make comments about the post, you can do them at the UsabilityBlog. 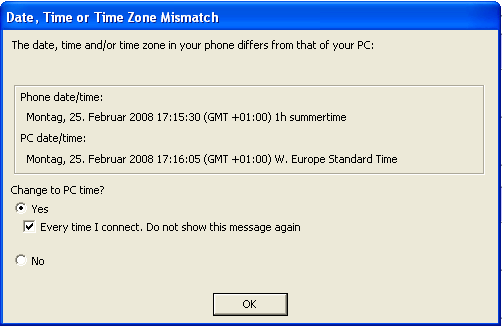 Every time I connected my Sony Ericsson phone to my Windows PC, I got reminded of an annoying feature of Sony Ericssons PC Suite: The time checker, that checks if the time of the cell phone is the same as the time of the PC (see picture below). Every time it popped up and asked me, if I wanted to change the time of my cell phone. The program assumed, that the time of the PC was always correct, but the opposite was the case: The cell phone time was correct, but the time of Windows was wrong. So I always had to select "No". The funny thing is: "Yes" had the addition "Every time I connect. Do not show this message again", but "No" didn't have such a checkbox. Make the right assumptions. Here it was assumed that the time of Windows is always correct, which may not always be the case. Note: The current Version of PC Suite is Version 3. This discussed time-checker-feature was implemented until Version 2. Nevertheless, it's a good example for bad usability. The University of Glasgow brings us a totally new kind of interface, to check for example the SMS inbox and power level of the mobile phone without looking at it. By shaking the cell phone the mobile phone generates audio and vibration. So it can give the feeling of small balls bouncing around inside of the phone. Each ball stands for one SMS and different senders generate different timbre (wooden or metallic balls). By shaking the phone, you can easily check approximately how many messages there are in your inbox and how important they are. Another scenario is to check the power level of your phone by shaking it. Your phone feels like a bottle filled with water. So when the power level is low, it sounds like a bottle with little water left. This interface is very intuitive, because it takes elements from the real world (balls in a can or water in a bottle) and uses it as metaphors for virtual items (SMS-messages and power level). This takes user-interfaces one step further. We already know desktop metaphors (for example: images of folders represent the datastructure "folder"), but these new metaphors combine audio and tactile feedback in a way that lets us experience interaction in a more natural way. A similar approach is followed by the inflatable USB-stick called Flashbag. It's very intuitive to check wheter the usb stick is full or empty.